A system for suppressing fires generated within air ducts. The system can include a duct with an aperture, a reservoir containing fire retardant material adjacent to the aperture, and a temperature-sensitive sidewall. The aperture can be sealed with the temperature-sensitive sidewall creating a temporary barrier to fluid communication with the interior of the duct and the reservoir. When a source of heat exists within the duct, the temperature-sensitive sidewall melts or ruptures, expelling fire retardant material. The temperature-sensitive sidewall can be a fusible plug or a frangible tube positioned within the duct in a non-obstructive fashion. The fire retardant material stored in the attached reservoir can be expelled into the interior of the duct, suppressing or retarding the source of heat in response to a temperature in excess to a predetermined value. 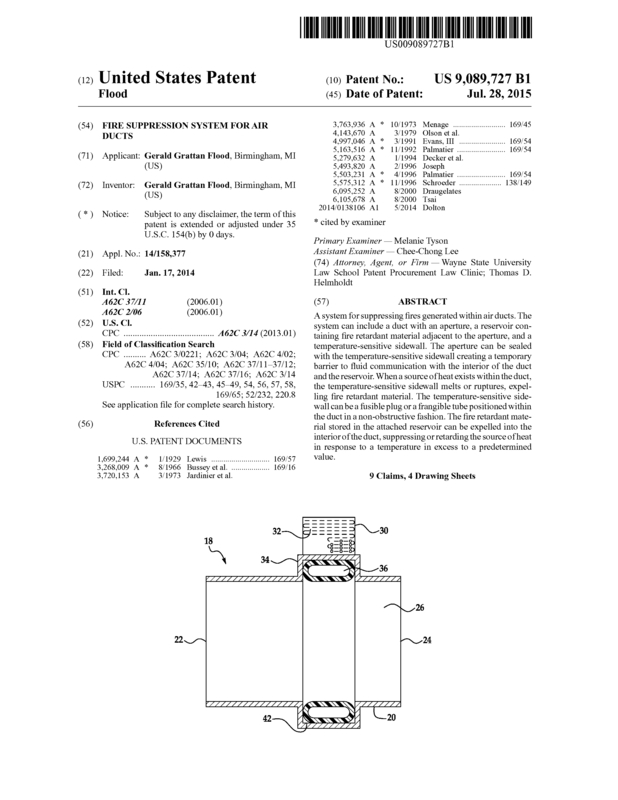 Page created at 2019-04-23 6:09:12, Patent Auction Time.